Note: The time grouping feature is new in Excel 2016. With time grouping, relationships across time-related fields are automatically detected and grouped together when you add rows of time fields to your PivotTables. 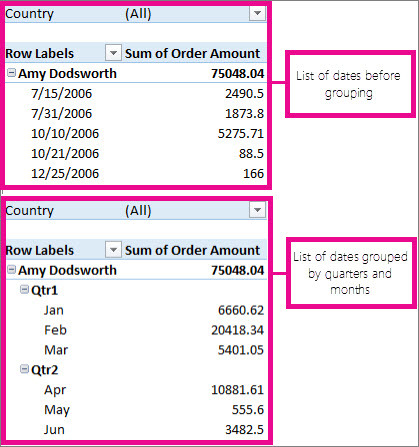 Once grouped together, you can drag the group to your Pivot Table and start your analysis. In the PivotTable, right-click a value and select Group. In the Grouping box, select Starting at and Ending at checkboxes, and edit the values if needed. Under By, select a time period. For numerical fields, enter a number that specifies the interval for each group. Hold Ctrl and select two or more values. Select Analyze > Field Settings. Change the Custom Name to something you want and select OK.
Right-click any item that is in the group.